Wire may be a great way to get secure messaging for a team, but what about clients, partners, and those that work outside of the team and don’t want to sign up for a full Wire account just to message every once in a while? Wire has a solution to that issue — a feature that allows people to use Wire without having to sign up for an account. That feature comes in the form of “guest rooms” in which guests can communicate with Wire users for one-time communication. The enhancement really helps make Wire a complete package. Not only does it allow for file sharing, audio and video calling, and messaging, but it does so securely with end-to-end encryption, and now allows for both internal and external communications. “Securely communicating internally, and then insecurely with partners, customers, job candidates, is madness,” said Morten Brøgger, CEO of Wire. “A company’s security should not be weaker when talking to third-parties and people outside their organization. 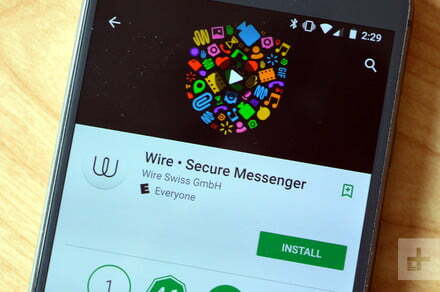 Wire recognizes this need, and is happy to be breaking new ground for end-to-end encrypted applications by offering this feature”. The new feature, which is available to Wire enterprise users, could be helpful in a number of situations. For example, customers can send job interview applicants a link to join a guest room, where they can conduct the interview securely through a video conference. There are other major features that help set Wire apart from the rest. For example, the service allows users to use one app with multiple accounts — so if you’re a freelancer and communicate with multiple organizations, you can do so with different profiles, or if you want a business account and a personal account, you can keep them separate as well. The Wire app is available on multiple platforms — you can use it on both Android and iOS, as well as on desktop computers. The biggest reason to go through Wire, however, is if you’re concerned about security. Wire bills itself as the most secure communications platform out there, and it encrypts all communications, including things like group calls and files. Other platforms, like WhatsApp, tout secure messaging — but they’re only just starting to support serious business use.